I’m a Canadian. Lived here all my life. So take it from me when I say prices for PC components get crazy up here. Like Australia, not a lot of PC stuff ships through Amazon, but we’re lucky enough to have a bunch of other PC stores. So we’ll be using a combination of those as well as Amazon.ca where available in order to put together the Canadian PC Build. Obviously it has to be called the Gretzky since it is amazing and will beat anything in the same league (read: price point), so let’s get started with something that doesn’t need to fight just to be the best. We’re gonna be going with the FX-6300 for this build. Not as good as the 8350 from the German build, but it’ll still be amazing, even in games. While we can’t afford an aftermarket CPU cooler, overclocking is still viable, as long as it is very modest. A few Ghz can be pushed out of it, and it’ll be amazing in games and multi-core applications that utilize more than two cores. An excellent value, as well. The motherboard for today is fully featured as always. Although you may not be able to get Crossfire out of it, you still have everything else to work with. Heatsinks over components, fan headers, onboard USB3.0 header, the works. This motherboard will also help overclock the CPU, since the Gigabyte UEFI system is really, really easy to work with. While the RAM doesn’t have a heatspreader or anything, it is still good RAM, because it’s made by Crucial. Not super fast or anything, but reliable as always. Nothing fancy here either, mainly because of budget reasons. It won’t be super fast to boot or load games, but the other areas of our system will make up for it. You still get a ton of space for all the nasty things, and games, we put on our hard drives. This is where most of the money went. Almost half, actually. It’ll be worth it, though. This monster of a card will run anything at 1080p on max settings, from Battlefield to Dragon Age… okay, it won’t run Assassin’s Creed Unity on max very well, but what will? 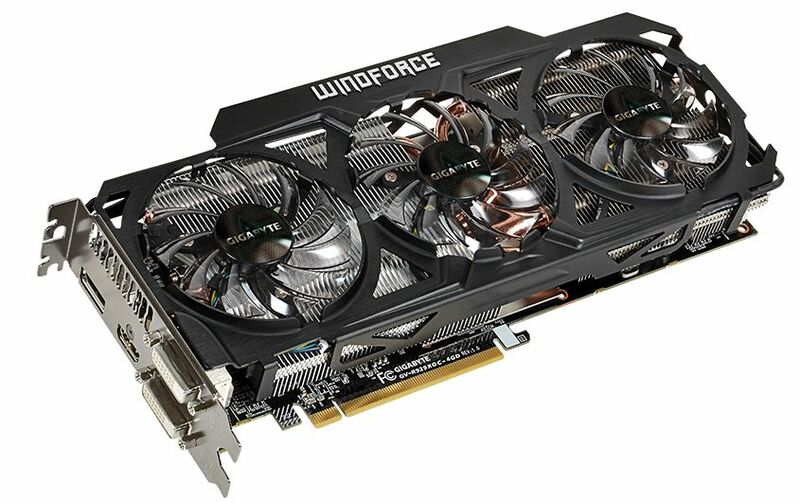 This card’s cooler is really interesting, featuring three fans, and a neat triangular heatsink designed to disperse the head evenly for better cooling. And since prices came down for this card, it has never been a more interesting option. Also, if you’re super crazy and bought a 4k monitor, nothing beats the R9 290 and 290x so far. While not the best case, again due to budget problems as well as some space issues, this case will do the job. It also has space for a 240mm radiator on the top if you want to upgrade to a water cooler in order to overclock your CPU. To maximize performance in this case, try to put as many fans as you can into it. It’ll help keep everything cool and get the GPU much needed fresh air. A standard 600W 80+ Bronze PSU, this was also the cheapest PSU we could get that would feel safe in this system. It’ll be enough to power everything well, and have enough overhead not to damage or blow up anything in the rig, which is always a good thing to know. So for just a titch over $700 CAD, you get the most powerful system you can get for your computer. Personally, I wish I had these options when I was upgrading back in February/March, because I would be super happy. There’s a reason I named it the Gretzky. It will break records and blow your mind during the game. The total price is $712.41 CAD according to PCPP, but you should always shop around and check deals. ALWAYS. In Canada, this is your gamer’s sweetspot, and man is it powerful! If you’re looking for stuff to play on your brand new beast, check out the TechRaptor Gamefanshop. Tons of great deals, even on new games, and a portion of what you buy goes to help keep us up and running. Bioshock Triple Pack for $17.50?! Well, don’t mind if I do.